Ron Hextall -- Hockey Hall of Famer? Home » Hockey » Does Ron Hextall Belong in the Hall of Fame? Does Ron Hextall Belong in the Hall of Fame? Not being a huge fan of the Los Angeles Kings, I had a hard time watching them skate around the ice with the most iconic piece of hockey hardware -- the Stanley Cup. As each player and coach hoisted the trophy, I couldn't help but wonder about the future of my team, the Flyers. Then I see Ron Hextall grab the Stanley Cup and put it above his head and I immediately thought of the Flyers again. This time, not their future, but their past. Memories of Hexy's rookie season quickly came to mind. I also wonder, does Ron Hextall belong in the Hall of Fame? During his magical 1986-87 rookie season, Hextall became a fast fan favorite with the Philly faithful. He may not have won the hearts of his opponents or fans around the league, but he certainly earned their respect. Hextall and the Flyers fell one game short of hoisting the Stanley Cup that year. They were beaten by the Edmonton Oilers. Led by Wayne Gretzky and Grant Fuhr, the Oilers might have been the best team ever. However, even though the Flyers ultimately lost, Ron Hextall's star shone brightly, winning the Conn Smythe Trophy for playoff MVP. He also won the Vezina and was named to both the All-Star and the All-Rookie Teams. Hextall led the league in games (66), wins (37), saves, saves percentage (.902) and minutes played. Add 15 more wins in the playoffs and you have one spectacular season. Can a Hall-of-Fame career be forged in one season? No, but it was a great start. 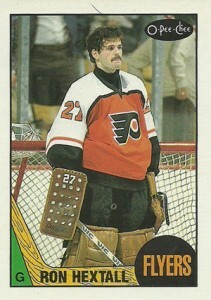 However, Ron Hextall made it to the Finals just one more time. In 1996-97, he and the Flyers lost to the powerful Detroit Red Wings. Hextall played 12 seasons in the NHL and revolutionized the game with his puck handling. He is the first NHL goalie to score a goal. He was a great team leader and he wore his emotions on his sleeve. This got him in trouble at times. But that is what made him Ron Hextall. Ron Hextall rookie cards can be found in 1987-88 O-Pee-Chee and 1987-88 Topps. Through the years, his cards have remained highly collectible and Hextall is regularly appearing in new releases. Autograph cards always remain a solid option. Should Hextall get the call for the Hall, expect a jump in both demand and prices for his cards and memorabilia. He may not have won the Stanley Cup as a player but that does not make him any less of a Hall-of-Fame-caliber goalie. Comparing his stats to other goalies already in the Hall, there is a great argument for him to be there as well. Hall of Fame? I think so! What do you think? 2017-18 Upper Deck SP Authentic Sign of the Times Ron Hextall 22 25 17-18 UD !!! Lou started collecting in 1973 at the age of seven. As a teen Lou sorted vending boxes into sets for a local dealer to earn money to keep his collecting habit at full strength. Lou works in the construction field, that takes him all over the tri-state area (NJ,PA,DE) and that allows him to find all the local card shops on his lunch breaks. He searches for those hard to find Mike Schmidt cards and looks to find every Eric Lindros card he doesn't have. He also has had the ear of the collectors while working in two different card shops in his spare time. He was good but not great. His biggest chance for getting into the HHOF would be due to how he changed the game with his stick-handling rather than his individual accomplishments.